View of living room from loft Bedroom Living room has a sleeper sofa Flat screen TV, free wireless internet, and cable TV. 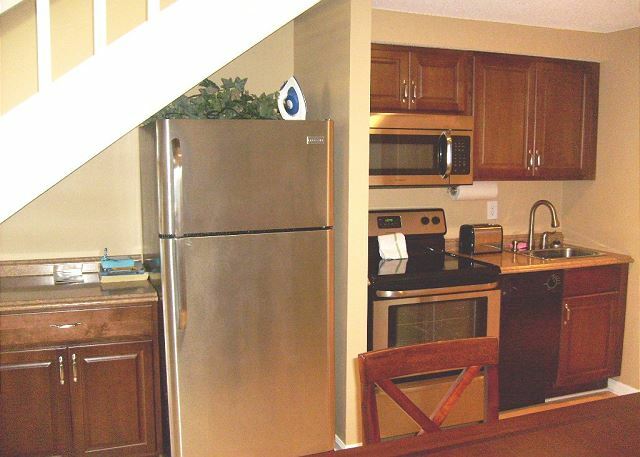 Save money and prepare beach snacks and family meals in this beautiful kitchen. There is a bagel/ coffee shop and seafood restaurant within walking distance as well. 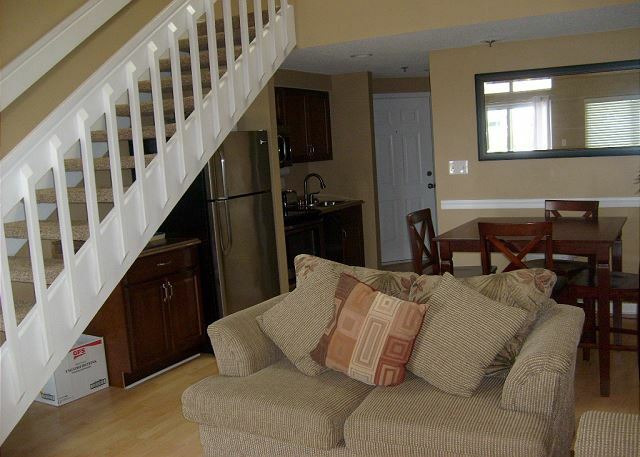 Staircase to loft bedroom upstairs Fully quipped kitchen with stainless steel appliances. 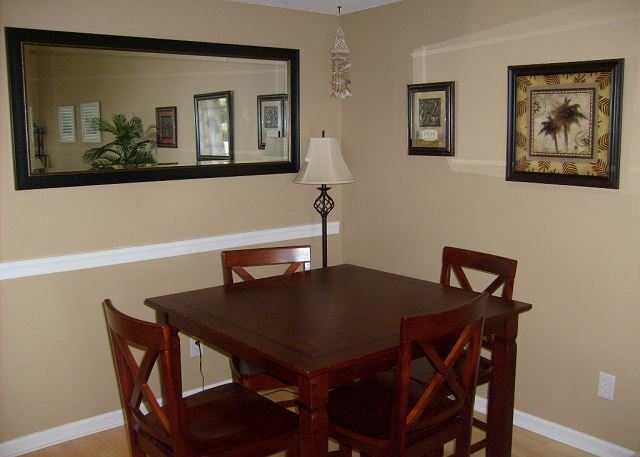 Dining room has seating for 4 people. 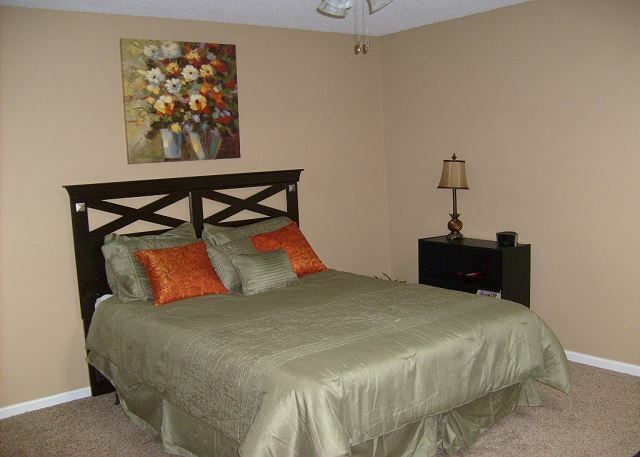 Queen size bed in loft bedroom Futon located in Master Bedroom Loft Shower/tub combo in the restroom. Restroom is located on the main level. 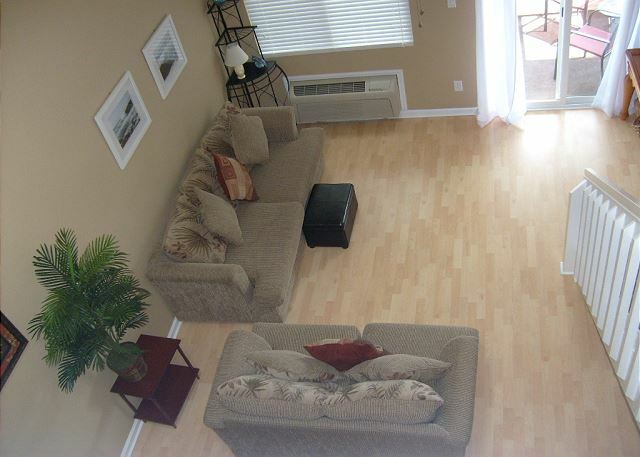 Very nice 1 bedroom loft condo located in the Golf and Tennis Club. 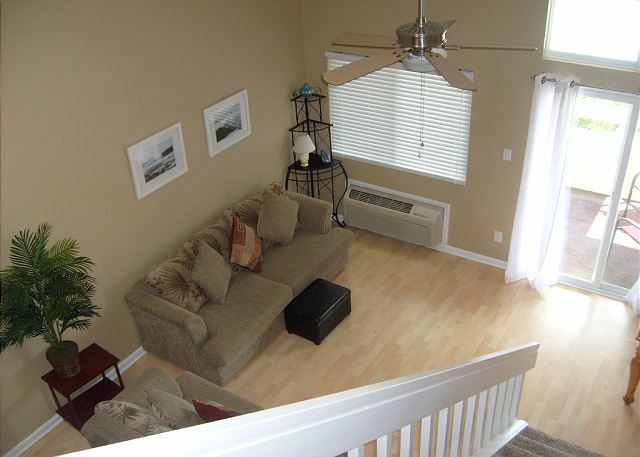 Just a short drive to the beach, this loft condo is perfect for a couple or a small family! 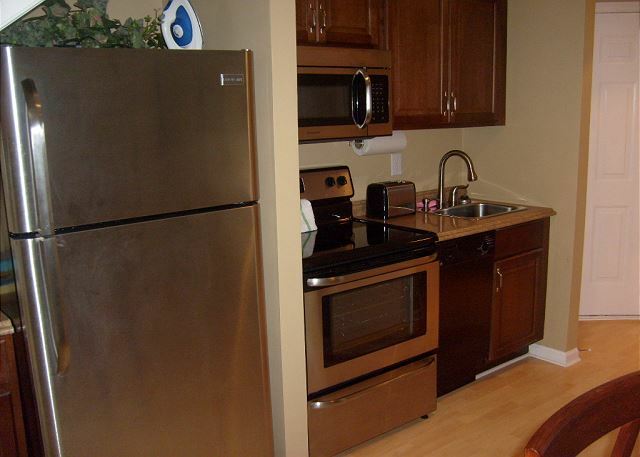 The condo has a fully equipped kitchen. 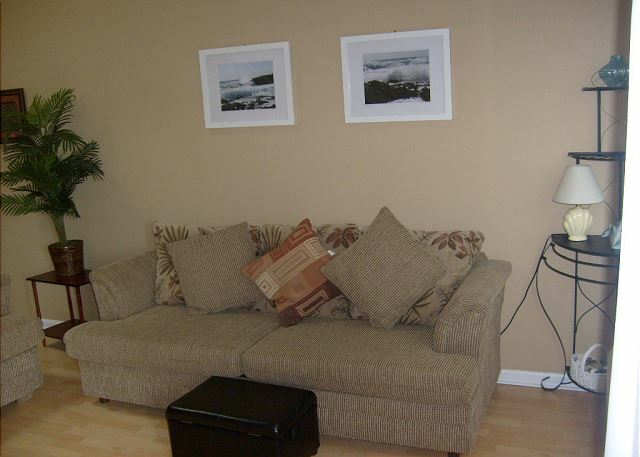 The living room features a flat screen TV and a sleeper sofa. 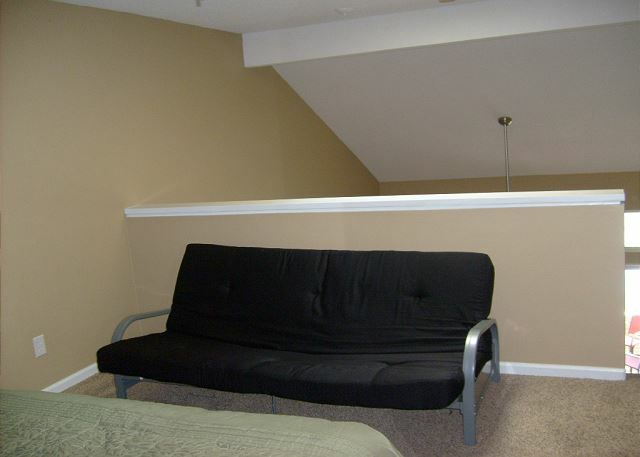 Upstairs is a loft bedroom with a queen size bed. 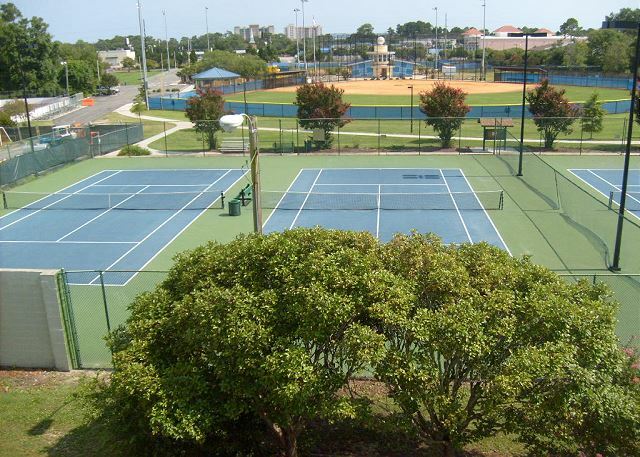 The condo's balcony overlooks the North Myrtle Beach Recreation Center's ball fields. There is a coin operated laundry right down the hallway for guests to use. 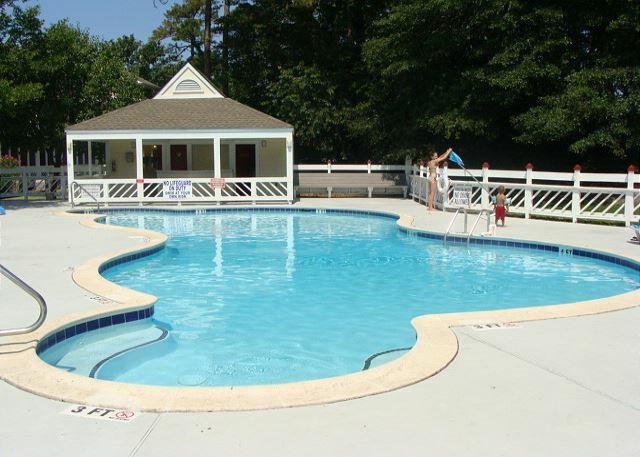 Families will enjoy this quiet neighborhood, as there is a sparkling outdoor swimming pool, tennis courts, and the recreation center's playground is just a short walk! The beach is just under a mile and there plenty of local restaurants nearby! 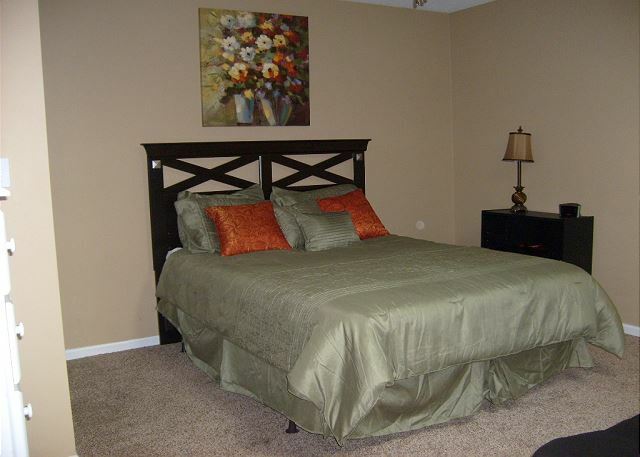 All linens and bath towels are included, except for linens for the sleeper sofa (Queen Size) For your convenience, this home includes WiFi and free parking. This building does not have a elevator. 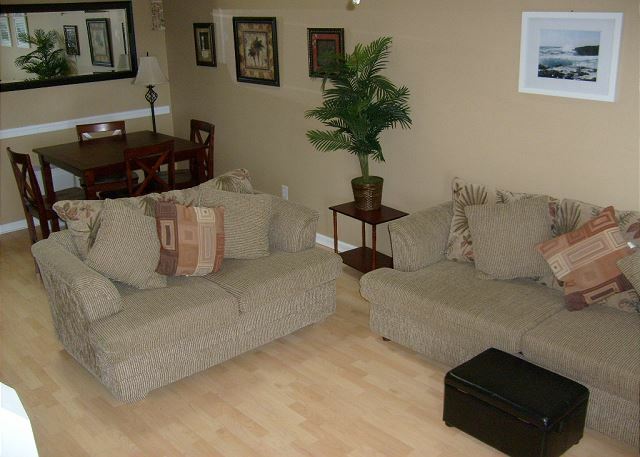 The condo was clean and well maintained. The pictures were spot on so that was a relief! 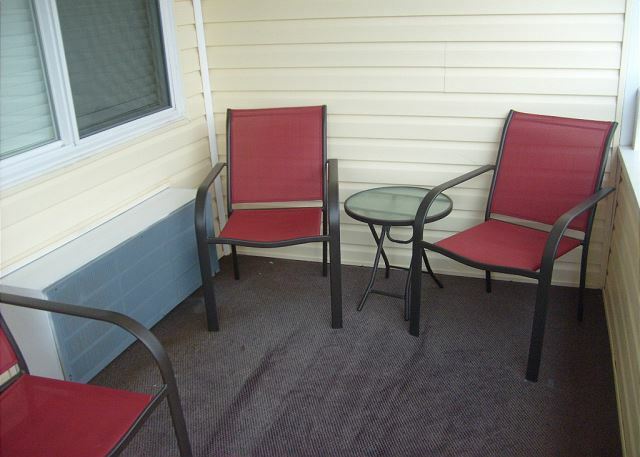 Perfect location, just of the main drag but close to everything. Can’t wait to book this one again! Thank you for your review. We are delighted your stay was great and can't wait to see you in 2019! 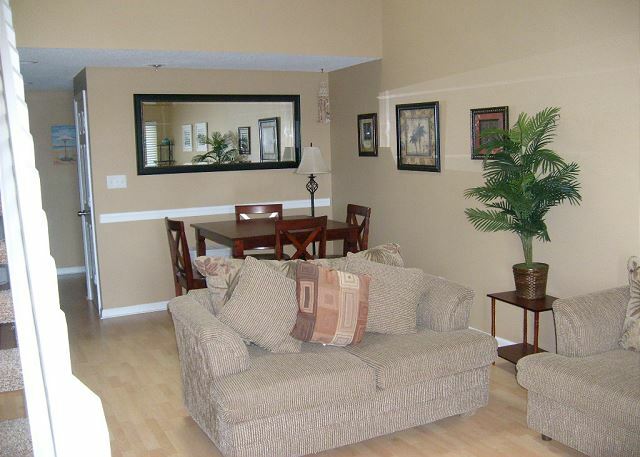 The inside of the condo was very nice and updated. Everything we needed to cook was there. It was a nice play to get away from the sun for a little. The outside was sketchy, not clean, looked run down. We had a great time at E324 in North Myrtle Beach. The condo was well furnish but was missing some pots and pans (to go in the oven! )...the rest was really great! Very nice unit. Extremely clean and looked exactly like the photos. 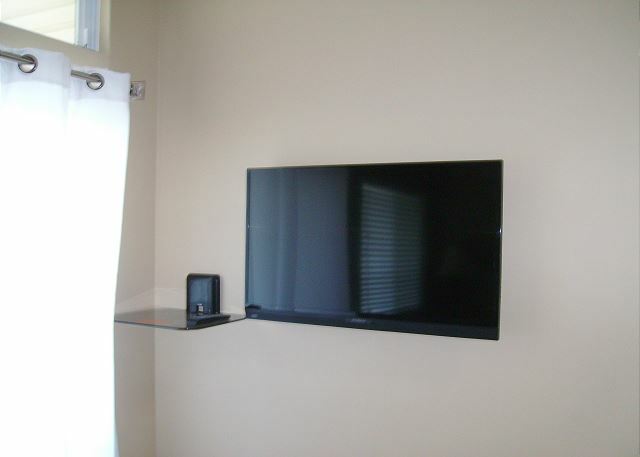 There was a tv in the bedroom along with the living room. The skylight above the bed was my only real disappointment- a blind there would be ideal! Please be mindful it's on the 3rd floor with no elevator. Kitchen was pretty well equipped but there was only 1 small round sheet pan, so another normal size would be nice. I would stay here again in the future without hesitation. The pool was larger than I expected so that was a plus! 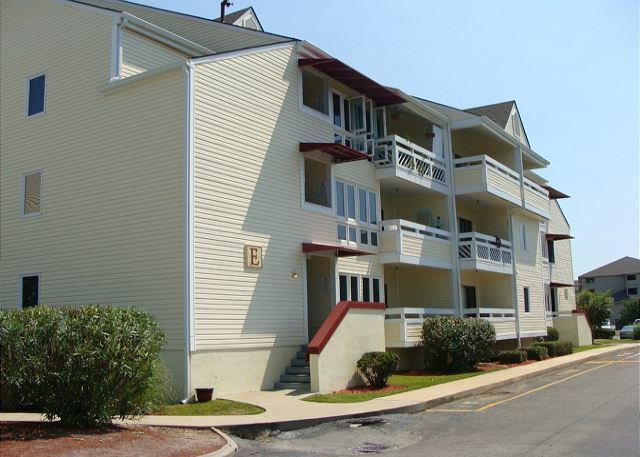 The location was good- in the heart of North Myrtle Beach. Only a few blocks to the beach. 1 mile from Walmart and 1 block off highway 17. The condo complex was quiet and we never had issue finding a parking spot. 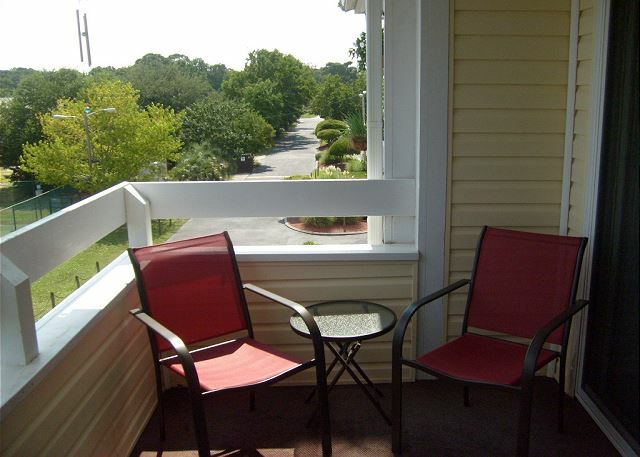 The balcony overlooks tennis courts so we had games to watch while drinking our coffee! 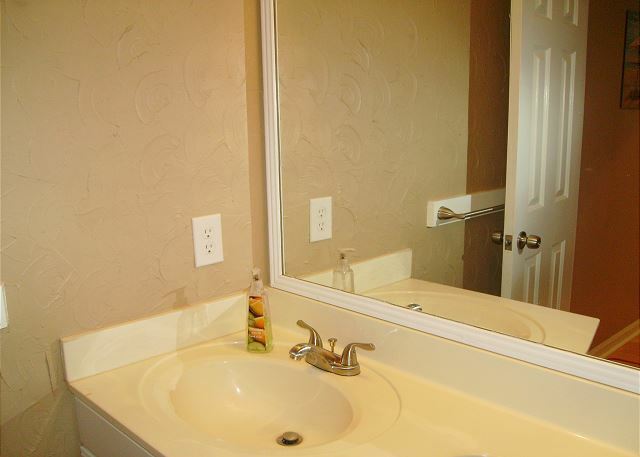 Good location, amenities, and privacy. Great golf at adjoining Possum Trot course. Beach was only 5 minutes drive. A/C on main floor didn't cool the upstairs loft bedroom very well. Don't recommend 3rd floor (no elevator) at Golf & Tennis complex. Loved the condo! The people at Southern Coast Vacations were extremely friendly! Would love to rent from them again! 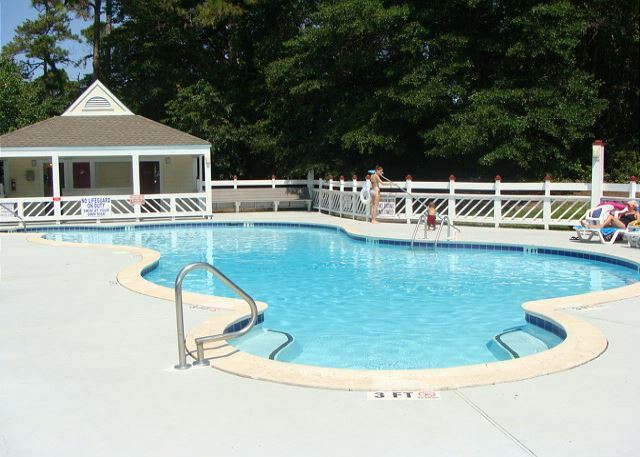 Thank you for choosing Southern Coast Vacations and Golf and Tennis E324! We hope that you stay with us again!